The support level at convergence of the moving averages (last week’s lows) looks as though it will hold. If it does, it will create another higher “swing low” on the right side of the base of consolidation. As we have pointed out several times in recent weeks, a valid base of consolidation should consist of both “higher lows” within the base, as well as tightening of the price action. $KOL presently meets this technical criteria. 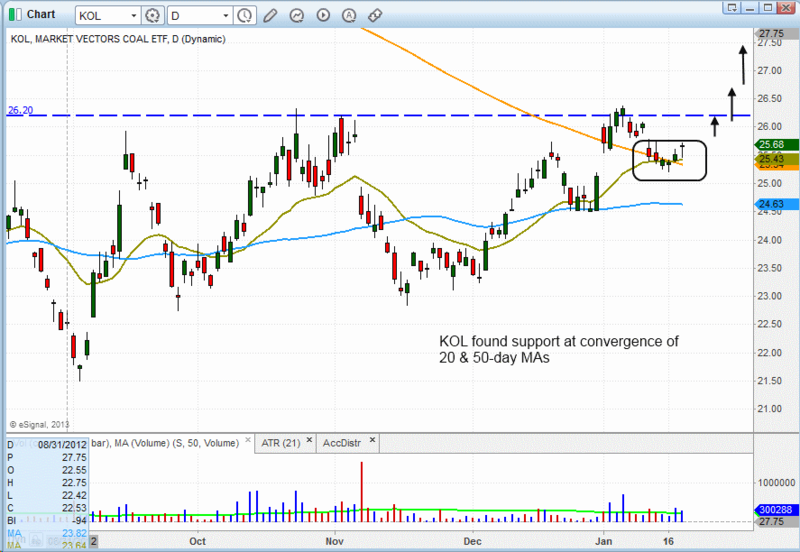 Because the price action of $KOL has been playing out exactly as anticipated, we are now stalking this ETF for potential swing trade buy entry going into today’s session. Although this is a “trend reversal” setup, rather than a potential breakout to new highs, we like the reward-risk ratio for trade entry near its current price. Regular subscribers to The Wagner Daily should note our exact trigger, stop, and target prices for the $KOL setup in the ETF Watchlist section of today’s newsletter above. 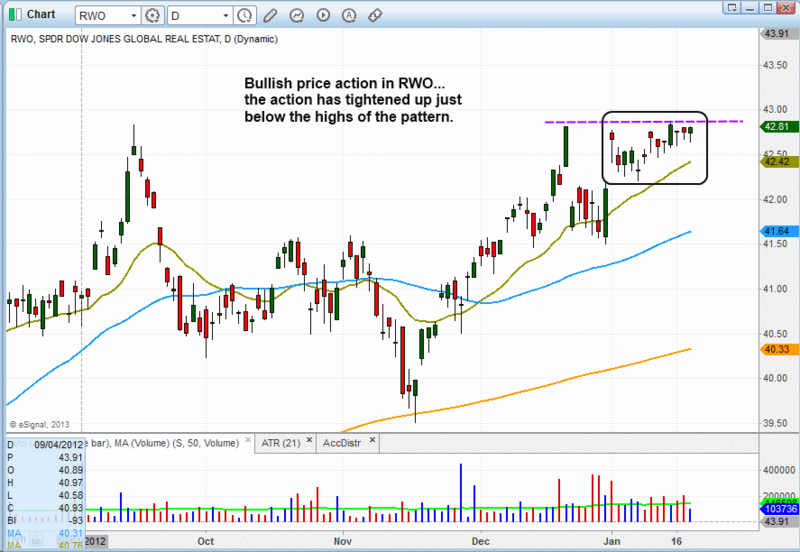 With $RWO, notice that the price action bottomed out by undercutting its prior swing low and then reversing sharply off major support of its 200-day moving average (orange line). Since then, the ETF has formed a series of higher highs and lows, with the price action tightening up just below the highs of the base. Note that this tightening of the price does not always have to form just below the highs of the base, as it could form anywhere from 5-10% off the highs and still be technically valid. Regardless, we like the recent price action in $RWO and expect the ETF to soon break out above the highs of the range. To learn the detailed methodology of our proven ETF and stock trading system, as well as to receive detailed entry and exit prices of our top ETF and stock swing trade picks, sign up for your 30-day risk-free subscription to The Wagner Daily at http://www.MorpheusTrading.com. I like the information you have on your site and it fits my trading style. I have been trading classical patterns and break out trades for some years now. I have found trading ETFs on breakouts difficult. In my experience the initial thrust past resistance (for example) always seems weak and returns below the entry point. I have seen this so many times that I stopped trading ETFs on breakouts. What is your experience in this area, do you limit break out trades to more volatile ETFs like KOL or apply that on others such as SPY or QQQ? You’re right that ETF breakouts have become increasingly more challenging over the years. Because of that reason, we now tend to buy more ETFs on a pullback AFTER they breakout. As far as when we buy ETFs on a breakout, rather than a pullback, there is a bit of discretion involved. No hard and fast rule. A lot of it depends on how tight and narrow the preceding consolidation was, as well as the length of the consolidation. However, I think we buy more breakouts on the the more volatile ETFs, such as leveraged ones.